Because of its general winter inhabitability, Alaska has a very short travel season, only running from mid-May to mid-September. Most visitors come during the summer months, which typically have the warmest weather and nearly 24 hours of daylight. However, the tiny autumn shoulder-season from mid-August to mid-September can be even more rewarding. Aside from the dwindling tourist crowds, Alaska experienced an Indian summer with long sunny days (about 14 hours), afternoons in the low 70s, and no rain. Plus, the clear skies allowed me perfect views of Mt. McKinley’s summit, which only happens about 20 percent of the time. But more importantly, with or without perfect weather, the fall brings natural events that the summer never sees. I witnessed golden aspen foliage at its peak, contrasting against blooming fireweed and other reddish mountain vegetation. Wild berries were ripe for picking and also attracted a host of mammals packing on the pounds before winter. And because northern animals, like caribou, were migrating to milder latitudes, wildlife sightings were abundant. Above all, the best benefit for me was the chance to gaze at the aurora borealis (northern lights) from my cabin window, something summer travelers have to miss, as it doesn’t get dark enough. No matter when you go, an Alaska vacation comes with a price. And just because this year’s travel season has ended, don’t assume that it’s too early to start thinking about next year. Here are some money-saving strategies that I uncovered while planning and taking my trip. There are two ways to get to Alaska: cruise or fly (unless you take several weeks off and trek through northwestern Canada). Looking to burn frequent flyer miles, and to appease my photo-enthusiast boyfriend, Jack, who preferred a more independent trip, I decided to take to the skies. Plus, he graciously offered to redeem his hard-earned miles, so how could I refuse? When I started planning in April, fares for September cost around $600 round-trip per person from Boston to Anchorage. Considering that a mile is worth about $0.02 (according to the industry standard), I knew that cashing in the 25,000 required Delta miles per ticket (valued at $500) was a good option. Unfortunately, Delta didn’t have award seats for flights around the time I wanted, so I checked with its codeshare partners, Continental and Northwest. Continental stepped up, despite booking us on a redeye, and all I had to pay was $10 per person for the taxes and fees. If you don’t have miles, and there are no sale fares when you are ready to book, a cheap way to get to Anchorage is by flying a low-cost carrier such as Southwest to Seattle, then hopping on an Alaska Airlines flight from there. I was planning on doing many side trips from Anchorage, so I decided to rent a car once I arrived. However, my choice to drive an SUV turned out to have its pluses and minuses. The good side included easier handling of mountain roads, extra height for viewing scenery and wildlife, and the feel of being on a more rugged adventure. The downside was the amount and cost of gas and difficulty finding an affordable rental. Because Alaska is so vast, cars are a big necessity for most, which places availability and price at a premium. The good news is that I stumbled upon a few ways to cut costs: plan ahead and watch prices, rent from an off-airport location, choose a smaller rental company, and look for a small SUV (opposed to a full-size). Because demand is so high, the likelihood of finding a last-minute bargain is slim. It’s best to book early, or else you may find yourself having to befriend a bush pilot. I watched prices for several months, and eventually booked a smaller 4×4 model for $385. Until that price appeared, the going rate was $525 (including taxes) for full-sized SUVs. By picking a car at that price, however, I had to make a few worthwhile concessions, such as taking my chances with an unknown company called Affordable New Car Rental. * Furthermore, the lot was located a mile or so away from the airport, which meant that I had to pay for transfers. Luckily, the short cab ride from the airport cost only $5, and the company offered free return transfers. Had I requested an airport pick-up, the company would have charged me eight percent of my total rental cost—ouch. In the end, I had no complaints with the company and it had none with me; after all, I didn’t return the car with a strong fish odor, something it specifically warned me against (this is Alaska, after all). Overall, choosing a small SUV opposed to a full-size meant a cheaper rental charge as well as less gas. And with gas costing up to 25 percent more outside of Anchorage ($2.50 a gallon near Denali National Park), economizing made a difference. I needed a hotel for three nights in Anchorage, three nights in Denali, and another two nights back in Anchorage. Alaska hotels are not cheap in general, so I decided to balance my budget on average (about $125 per night), rather than trying to match that rate at every stay. For the first set, I decided to pay a bit more per night. I booked with the highly recommended Copper Whale Inn, located right downtown with views of Cook’s Inlet and the Alaska Range. With taxes, I paid $470 for three nights, which came to $157 per night ($78 per person). Despite the price, I felt the value was relatively high because it came with a full cooked breakfast every morning and free Internet, which was helpful for last-minute planning. As it turns out, the inn was a great choice for the beginning of the trip because the friendly staff (a benefit that often comes with staying at a B&B) helped us get situated, thus optimizing our experience. I picked a cheaper, less distinctive hotel for my second Anchorage stay. I chose the Long House Alaskan Hotel, which offered the cheapest price on Expedia. I called the hotel directly and booked its off-peak rate of $69 per night. As it turns out, this hotel offered a free night through the The Great Alaskan TourSaver book, which I already had (scroll down for more details). My total for two nights with continental breakfast came to only $75 including taxes ($37) per person). For my Denali stay, the Denali River Cabins’ affordable prices caught my eye. I secured the shoulder season rate of $99 ($139 peak). In addition, due to an overbooking glitch, I was upgraded for free to a cabin right on the Nenana River (normally $129 off-peak, $169 peak). With taxes, I spent $318 for three nights ($159 per person). To save money further, I could have stayed in the off-river Cedars Lodge, and received a free night using the Great Alaskan TourSaver book, but I couldn’t pass up being right on the river. 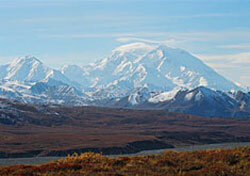 Purchase The Great Alaskan TourSaver. This coupon book costing $100 saved us about $515 combined. With it, we only paid half price on a heli-hiking tour (a $359 value) and a glacier cruise in Prince William Sound (a $118 value), and got various freebies, from coffee and admissions to hotel nights. The book is packed with many other saving opportunities. Tip: Although many providers are responsive when you present the coupons, sometimes you have to be extra assertive when it comes to actually getting the discount. It’s always best to mention the coupon when you book and to read all the fine print; sometimes tricky restrictions might take you by surprise. Buy in Anchorage. Contrary to the popular belief that things cost more in cities, Anchorage is the place for the best buys in Alaska. Gas, priced just under $2 per gallon downtown, increased dramatically the further out we went (up to $2.50 near Denali). Souvenirs, which were the same items everywhere, cost significantly less in general. The only exception was the items at stores closing for the season near Denali, which often slashed price tags up to 60 percent. For gear, the Army-Navy store in downtown Anchorage had impressive values on last-minute outdoor sundries. Watch where you eat. Food in general is expensive. Expect $20 to $40 dinner entrees and $8 to $14 breakfast and lunches, even for casual restaurants. One sure way to keep costs down is to eat at the many microbreweries and pubs. In Anchorage, one of my favorites was Moose’s Tooth, with specialty pizzas (on whole-wheat crusts) for around $10. For more of a splurge, Glacier Brewhouse is a must (a few items fall below $20). Cafes are also a good option. In Anchorage, I liked Snow City Cafe, which serves hearty breakfasts for under $10 until 4 p.m. In Talkeetna, the eccentric Talkeetna Roadhouse offered food for similar prices, and the cinnamon rolls alone are worth a visit. Near Denali National Park, I singled out McKinley Creekside’s cafe for having some of the best food at the best prices, for example, reindeer sausage jambalaya for $18. Although the food I sampled was enjoyable and well prepared, it wasn’t anything too unlike what you can find in the lower 48. Don’t feel like you’re missing out if you choose to patronize a staple chain, like Subway or Applebee’s, to keep costs down. Visit national parks. National park fees are minimal and can provide days worth of activities. I visited three parks: Denali National Park and Preserve, Kenai Fjords National Park, and Chugach National Forest. Denali was the most expensive at $28 per person for shuttle bus fare for the eight-hour Eielson route and park entrance (fees are rumored to double for 2005). If you’re a national park frequenter, you can save if you have a National Park Pass for $50 a year. Seniors can save even more with the Golden Age Passport, which costs $10 for life. Also, the first 15 miles into the park, accessible by car or foot, are free. Within that boundary, you can view wildlife and scenery, enter the visitor’s center, and swing by the Denali kennels to play with the resident sled dogs and pups. Exploring Kenai’s Exit Glacier cost me only $5, and my drive along the scenic Seward Highway through Chugach was completely free. Look for wildlife. Alaska is saturated with wildlife, and sightings are possible just about anywhere, even in downtown Anchorage. Inside and/or outside the parks, I saw a host of animals, including bald eagles, golden eagles, ptarmigan, grizzly bears, a fox, caribou, moose, dall sheep, ravens, sea otters, harbor seals, and arctic ground squirrels. Get on the right lists. Stay abreast of the latest promotions by subscribing to Scott McMurren’s Alaska TravelGram, Alaska Airlines, and the Anchorage Convention and Visitors Bureau newsletters. The Anchorage CVB has already started offering early bird discounts for the 2005 season. Pan for gold. You can still pan for gold throughout the state at little or no cost. Who knows, if you’re lucky enough, you’ll hit the mother lode and can take saving money to a whole new level. Although visiting Alaska off peak turned out to be a great experience for me, keep in mind that the season ends abruptly. Many hotels and other services literally shut down overnight. It wasn’t uncommon for restaurants to run out of menu items, sometimes even staples like flour and toast! Before booking, always check to make sure that the things you’ll want to do will be up and running. Nevertheless, my willingness to venture during the off-season, combined with careful planning, allowed me to experience this far-off land with money to spare. After all, if the wildlife conserves its resources for the coming winter, why shouldn’t I? * Editor’s note: Since publication of this article, Affordable New Car Rental has gone out of business.